There is some evidence that, in addition to being a writing system, runes historically served purposes of magic. This is the case from earliest epigraphic evidence of the Roman to Germanic Iron Age, with non-linguistic inscriptions and the alu word. An erilaz appears to have been a person versed in runes, including their magic applications. 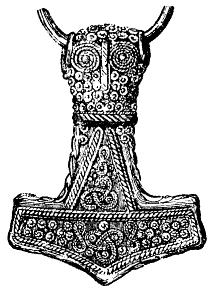 In medieval sources, notably the Poetic Edda, the Sigrdrífumál mentions "victory runes" to be carved on a sword, "some on the grasp and some on the inlay, and name Tyr twice." In early modern and modern times, related folklore and superstition is recorded in the form of the Icelandic magical staves. In the early 20th century, Germanic mysticism coins new forms of "runic magic", some of which were continued or developed further by contemporary adherents of Germanic Neopaganism. Modern systems of runic divination are based on Hermeticism, classical Occultism, and the I Ching. Bracteate G 205 (ca. 5th to 7th century), bearing the inscription alu. They attach the highest importance to the taking of auspices and casting lots. Their usual procedure with the lot is simple. They cut off a branch from a nut-bearing tree and slice it into strips these they mark with different signs and throw them at random onto a white cloth. Then the state's priest, if it is an official consultation, or the father of the family, in a private one, offers prayer to the gods and looking up towards heaven picks up three strips, one at a time, and, according to which sign they have previously been marked with, makes his interpretation. If the lots forbid an undertaking, there is no deliberation that day about the matter in question. If they allow it, further confirmation is required by taking auspices. It is often debated whether "signs" refers specifically to runes or to other marks; both interpretations are plausible and Tacitus does not give enough detail for a definite decision to be made. The inscription on the Kylver stone ends with a stacked bind rune combining six Tiwaz runes used to invoke the god Tyr and four Ansuz runes to invoke the Æsir. The Ansuz and Tiwaz runes in particular seem to have had magical significance in the early (Elder Futhark) period. The Sigrdrífumál instruction of "name Tyr twice" is reminiscent of the double or triple "stacked Tyr" bindrunes found e.g. on Seeland-II-C or the Lindholm amulet in the aaaaaaaazzznnn-b- muttt, sequence, which besides stacked Tyr involves multiple repetition of Ansuz, but also triple occurrence of Algiz and Naudiz. Many inscriptions also have meaningless utterances interpreted as magical chants, such as tuwatuwa (Vadstena bracteate), aaduaaaliia (DR BR42) or g͡æg͡og͡æ (Undley bracteate), g͡ag͡ag͡a (Kragehul I). Alu is a charm word appearing on numerous artifacts found in Central and Northern Europe dating from the Germanic Iron Age. The word is the most common of the early runic charm words and can appear either alone or as part of an apparent formula. The origin and meaning of the word are matters of dispute, though a general agreement exists among scholars that the word either represents amulet magic or is a metaphor (or metonym) for it. A few Viking Age rings with runic inscriptions of apparently magical nature were found, among them the Kingmoor Ring. The phrase "runes of power" is found on two runestones in Sweden, DR 357 from Stentoften and DR 360 from Björketorp. Runestones with curses include DR 81 in Skjern, DR 83 in Sønder Vinge, DR 209 in Glavendrup, DR 230 from Tryggevælde, DR 338 in Glemminge, and Vg 67 in Saleby. Biór fori ec þer /brynþings apaldr! godra galdra / oc gamanruna. Spells full good, and gladness-runes." hugrunar "thought-runes" (stanza 12, the stanza is incomplete, but clearly discussed a spell to improve one's wit). Other oft cited sources for the practice of runic divination are chapter 38 of Snorri Sturluson's Ynglinga Saga, where Granmar, the king of Södermanland, travels to the Temple at Uppsala for the seasonal blót. "There, the chips fell in a way that said that he would not live long" (Féll honum þá svo spánn sem hann mundi eigi lengi lifa). Another source is in the Vita Ansgari, the biography of Ansgar the Archbishop of Hamburg-Bremen, which was written by a monk named Rimbert. Rimbert details the custom of casting lots by the pagan Norse (chapters 26-30). The chips and the lots, however, can be explained respectively as a blótspánn (sacrificial chip) and a hlautlein (lot-twig), which according to Foote and Wilson  would be "marked, possibly with sacrificial blood, shaken and thrown down like dice, and their positive or negative significance then decided." Egils Saga features several incidents of runic magic. The most celebrated is the scene where Egil discovers (and destroys) a poisoned drink prepared for him, by cutting his hand and cutting runes on the drinking horn, and painting the runes with blood. While the motif of blood painted runes also appears in other examples of early Norse literature it is uncertain whether the practice of painting runes with blood is merely a literary invention or whether it had precedence in magical practice. In the 17th Century, Hermeticist and Rosicrucian Johannes Bureus, having been inspired by visions, developed a Runic system based on the Kaballah and the Futhark which he called the Adulruna. The Armanen runes "revealed" to Guido von List in 1902 were employed for magical purposes in Germanic mysticism by authors such as Friedrich Bernhard Marby and Siegfried Adolf Kummer, and after World War II in a reformed "pansophical" system by Karl Spiesberger. More recently, Stephen Flowers, Adolf Schleipfer, Larry E. Camp and others also build on List's system. Several modern systems of runic magic and runic divination were published from the 1980s onward. The first book on runic divination, written by Ralph Blum in 1982, led to the development of sets of runes designed for use in several such systems of fortune telling, in which the runes are typically incised in clay, stone tiles, crystals, resin, glass, or polished stones, then either selected one-by-one from a closed bag or thrown down at random for reading. Later authors such as Diana L. Paxson and Freya Aswynn follow Blum (1989) in drawing a direct correlation between runic divination and tarot divination. They may discuss runes in the context of "spreads" and advocate the usage of "rune cards". Modern authors like Ralph Blum sometimes include a "blank rune" in their sets. Some were to replace a lost rune, but according to Ralph Blum this was the god Odin's rune, the rune of the beginning and the end, representing "the divine in all human transactions". 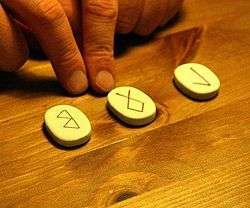 In 1982, a modern usage of the runes for answering life's questions was apparently originated by Ralph Blum in his divination book The Book of Runes: A Handbook for the Use of an Ancient Oracle, which was marketed with a small bag of round tiles with runes stamped on them. This book has remained in print since its first publication. The sources for Blum's divinatory interpretations, as he explained in The Book of Runes itself, drew heavily on then-current books describing the ancient I Ching divination system of China. The Book of Runes: A Handbook for the Use of an Ancient Oracle: The Viking Runes (1982); revised 10th Anniversary Edition (1992); revised 25th Anniversary Edition (2007). The Rune Cards: Sacred Play for Self Discovery (1989); reissued as The Rune Cards: Ancient Wisdom For the New Millennium (1997). Rather than rune stones, this book uses images of the runes printed on card stock, much like a set of trading cards or tarot cards. The Healing Runes with co-author Susan Loughan (1995) teaches methods for using runic divination in the context of health and personal integration. The Serenity Runes: Five Keys to the Serenity Prayer with co-author Susan Loughan (1998); reissued as The Serenity Runes: Five Keys to Spiritual Recovery (2005) utilizes runic divination as a method for assisting self-help and recovery from addictions; the title is a reference to the well-known Serenity prayer widely used in the 12-step program of Alcoholics Anonymous. Ralph H. Blum's Little Book of Runic Wisdom (2002). The Relationship Runes: A Compass for the Heart with co-author Bronwyn Jones (2003) shows how to use runic divination in matters of love and friendship. Blum has also written books on the Tao Te Ching, Zen Buddhism, and UFOs. At The Well of Wyrd (1988) which was later reprinted under the title Runecaster’s Handbook: The Well of Wyrd. Northern Magic: Rune Mysteries and Shamanism (2002). Runic divination is a component of Flowers' "esoteric runology" course offered to members of his Rune Gild, as detailed in The Nine Doors of Midgard: A Curriculum of Rune-Work. Besides runic divination, Flowers also advocated the "runic gymnastics" (Runengymnastik) developed in the 1920s by Friedrich Marby, under the name of "Rune-Yoga" (also "Runic Yoga", "Stadhagaldr"). In 1990, Stephan Grundy, a.k.a. Kveldulf Gundarsson, described runic magic as the active principle as opposed to passive interpretations based on runic divination. He held that runic magic is more active than the allegedly shamanic practice of seid practiced by the Seiðkona. Runic magic, he states, uses the runes to affect the world outside based on the archetypes they represent. Most of Gundarsson's runic magic entails being in possession of a physical entity that is engraved with any or all of the individual runes or "staves", so as to practically work with their energies. The individual runes are reddened with either blood, dyes, or paints. The act of possessing the stave in its final form serves the purpose of affecting the world of form with "the rune might" of that particular stave. After use, the staves are discarded or destroyed. Gundarsson holds that each rune has a certain sound to it, to be chanted or sung; the sound has in common the phonetic value by which it is represented. This act of singing or chanting is supposed to have more or less the same effect of using the staves in their physical form. Nigel Pennick proposes "Germanic Runic Astrology" in publications such as Runic Astrology: Starcraft and Timekeeping in the Northern Tradition (1995), ISBN 1-898307-45-8. Freya Aswynn has published interpretations of the runes based on her own meditations in Leaves of Yggdrasil: Runes, Gods, Magic, Feminine Mysteries, and Folklore Llewellyn Worldwide (1990), ISBN 0-87542-024-9 and Northern Mysteries and Magick: Runes, Gods & Feminine Powers (1998), Llewellyn Worldwide ISBN 1-56718-047-7. Adam Byrn Tritt, in Runic Divination in the Welsh Tradition (2011) presents a system based on a 10-stone set, including nine symbols which are unrelated to the historical runes, plus a blank stone, which represents the querent (inquirer). Diana L. Paxson deals with the subject of runic divination and the use of the runes in magical spell-casting in her book Taking Up The Runes: A Complete Guide To Using Runes In Spells, Rituals, Divination, And Magic (2005). Wendy Christine Duke in Spiral of Life (2008) presents a divination system based on organizing a set of 41 "revealed images" based on the runic letters. Runen - The Wisdom of the Runes(2016) by A.D. Mercer, recently published by Aeon Sophia Press, reintroduces the Armanen Runes of Guido von List as a system of runic magic minus any volkish ideology. ↑ Spurkland, Terje (2005). Norwegian Runes and Runic Inscriptions. Boydell Press. p. 16. ISBN 1-84383-186-4. ↑ Macleod and Mees (2006), 91-101. ↑ Nielsen, M. L. (1998). "Glavendrup". In Hoops, Johannes; Beck, Heinrich. Reallexikon der Germanischen Altertumskunde. 12. Walter de Gruyter. p. 198. ISBN 3-11-016227-X. ↑ translation and numbering of stanzas after the edition by Henry Adams Bellows (1936). ↑ "Such runes were believed to transfer sickness from the invalid to the tree. Some editors, however, have changed limrunar ("branch runes") to lifrunar ("life-runes")" Bellows (1936), p. 392. ↑ "Here the list of runes breaks off, though the manuscript indicates no gap, and three short passages of a different type, though all dealing with runes, follow." Bellows (1936) p. 393. ↑ Foote and Wilson (1970), 401. ↑ MacLeod and Mees (2006), 235. ↑ Blum, Ralph (2000). The Book of Runes: 20th Anniversary Edition. Eddison Sadd. pp. 133–134. ISBN 1-85906-042-0. ↑ Edred Thorsson, Futhark: A Handbook of Rune Magic, Weiser Books, 1984, p. 15. Edred Thorsson, Rune might: secret practices of the German rune magicians, Llewellyn's Teutonic magick series, 1989. Edred Thorsson, The Truth About Teutonic Magick, Llewellyn's vanguard series, 1994. Later also: L. E. Camp, A Handbook of Armanen Runic-Wisdom: History, World-View, Rune-Yoga, Divination, the Sidereal Pendulum and the Runic-Zodiac, 2005. Criticized by Sweyn Plowright, The Rune Primer, 2006 (esp. pp. 137-139). ↑ Gundarsson (1990), 27; 211; 211-212. ↑ Gundarsson (1990), 33; 34; 27. ↑ Spiral of Life - A Guidebook For Your Journey (2008) Cloud Haven Studio Incorporated, ISBN 978-0-9818693-0-8. Blum, Ralph (1993). The Book of Runes : A Handbook for the Use of an Ancient Oracle: The Viking Runes with Stones, St. Martin's Press; 10th anniversary ed. ISBN 0-312-09758-1. Flowers, Stephen (1986), Runes and magic: magical formulaic elements in the older runic tradition, vol. 53 of American university studies: Germanic languages and literatures, P. Lang, ISBN 978-0-8204-0333-5. Gundarsson, Kveldulf (1990). Teutonic Magic. St. Paul, MN: Llewellyn Publications, Inc. ISBN 0-87542-291-8.